Providing you the best range of honeycomb type grating with effective & timely delivery. Honeycomb type grating offered by us are well proven way of anchoring in areas bearing high temperatures like in refractory concrete as well as for wear protection of high-temperature resistant ceramic. 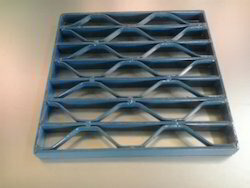 These honeycomb gratings can be made available in different mesh sizes including thickness of 20 - 25 mm and are mounted in a platform similar to an expanded metal mesh. Further, this mesh comes welded at short distance to steel structure so as to provide durability to the structure created. Here, these gratings can be provided with different spacers including round bar, square steel, flat bar and others.